These are some photos from last Spring that I kind of forgot about for a while, but I like them and wanted to put them on a blog here. 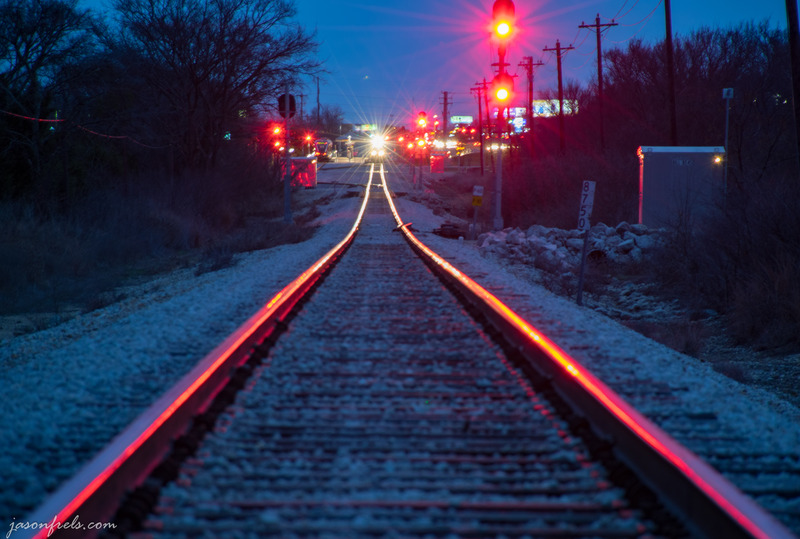 As I would drive over the tracks up the rail from the metro train station on some evenings, I would see the red lights reflected down the rails into the distance. I came back with my camera, a Nikon D5300 at this time, and tried to capture this scene. I set up on the tracks to look down toward the train station as one of the trains was at the station. I wanted the rails to go off into the distance to the train lights. And I wanted the smooth rails reflecting the red light. During metro-rail hours, the trains do not go past this train station as it is the end of the line. So, I was not in danger of being hit by a train. The freight trains run in the middle of the night after the metro-rail has shut down. After taking this picture, I went down to the station itself to see what I could shoot. Seeing the brightly lit station and the dark sky, I decided that it might look good in HDR. I took 3 exposures, each a stop apart and merged them in Photoshop. With the picture below, I wanted the front of the train close to the camera and the train to fade away quickly into the distance. I set up the camera and tripod very close to the train. The train station platform was deserted as it was between runs, so I had the freedom to shoot without anyone around. This was with a 16mm lens on the D5300 which is an APS-C camera. The 35mm equivalent focal length is 24mm. I took some other shots down around the train tracks trying a few different angles, but wasn’t very happy with those results. Perhaps I could have used a polarizer to knock down all of the reflections in the train windows. I went down to the other end of the platform and got the sidewalk and rails in the shot as well. The walkway and platform are all well lit without the sky being under-exposed and black. 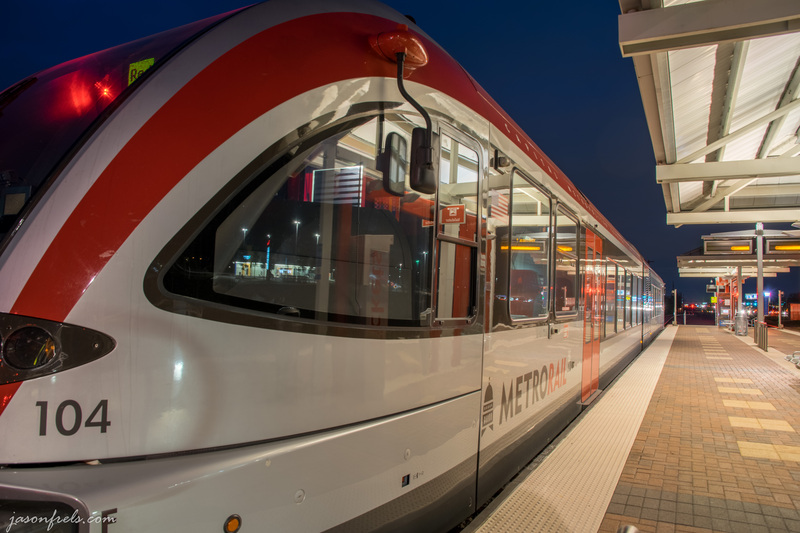 This train runs from downtown Austin up to the Leander station, which I live near. 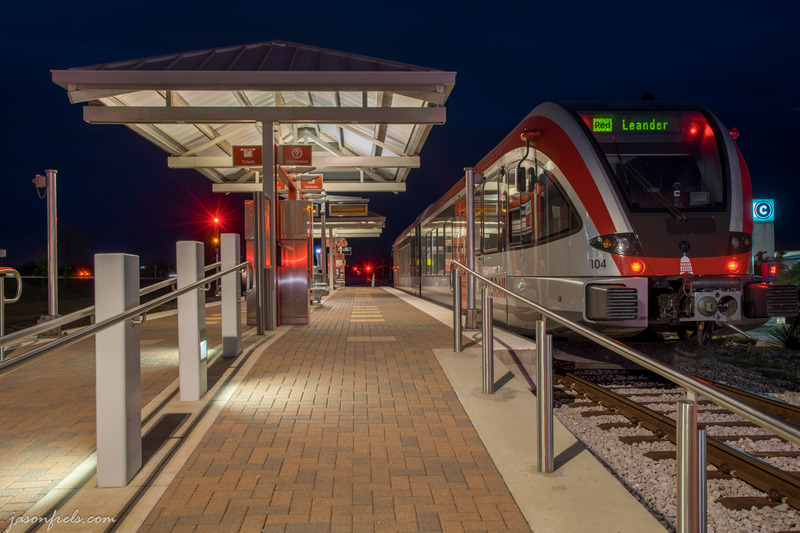 On a Friday night, the trains run until after midnight, so you can go party downtown and take the train back up to Leander and avoid the parking nightmare downtown. It has been rainy this week in the Austin area. I hope to get back out with my camera soon. Thanks for reading.